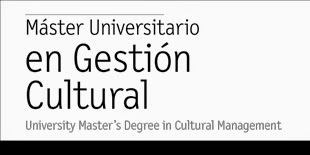 Máster Universitario en Gestión Cultural - UIC - MA in Arts and Cultural Management: Come meet us this Thursday! If you are interested in our MA, we are looking forward to meeting you personally this Thursday. We will be at 16:00h in room Alpha 503, with the Coordinator of the programme, Dr. Consuela Dobrescu, and with one of our marvellous Alumni, Miss María Jesús García Palomares - currently employed in Grupo Focus. You find all the info here, on our webpage.